The Pyramids - A view of the Pyramids is one of the most famous views on earth. These ancient "super-structures" date all the way back to Egypt's Old Kingdom. The tallest, known as the Great Pyramid, is one of the Seven Ancient Wonders of the World. So enduring is it that, despite being the oldest of all the ancient wonders, it is the only one which still survives. And so massive as well, that it remained the tallest man-made structure on earth until the construction of the Eiffel Tower in the 19th-century. 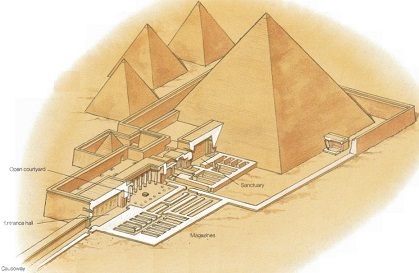 The Pyramids were the tombs of the early pharaohs, Khufu, Khafre and Mankaure.